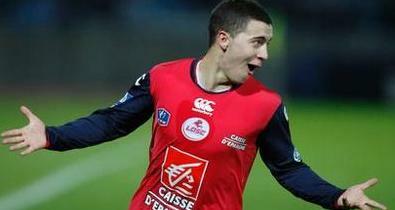 Lille's academy director Jean-Michel Vandamme has claimed Chelsea are paying most attention to £40m-rated youngster Eden Hazard. With the likes of Didier Drogba, Nicolas Anelka and Frank Lampard now enjoying their twilight years, Blues manager Andre-Villas Boas has been keen to introduce more youth and flair to his squad at Stamford Bridge, with a number of young players joining the club over the summer. The Portuguese has already stated his admiration for Genk's Kevin De Bruyne, but it is Lille star Hazard who is currently attracting most attention around Europe. Arsenal, Liverpool, Manchester City and Inter Milan are all believed to be pursuing the 20-year-old, but it is Chelsea who head the queue. Hazard's agent has already revealed that Arsenal failed in their attempt to sign the playmaker during the summer transfer window.